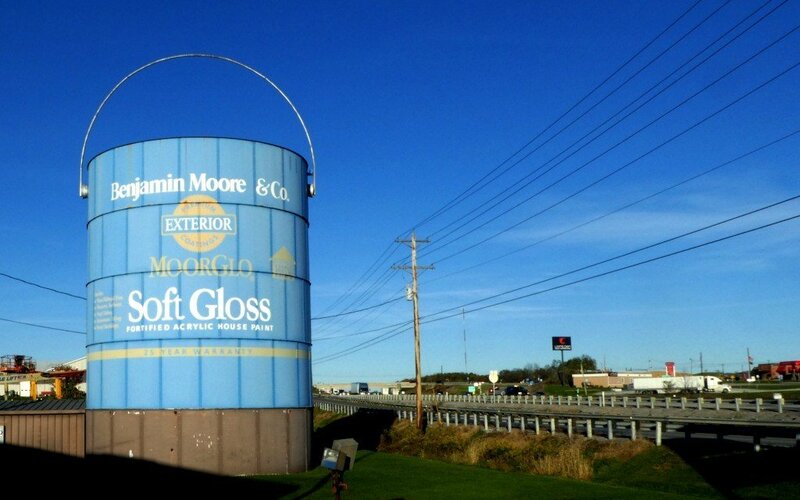 Visible from I-81 in Pennsylvania between Shippensburg and Chambersburg is the world’s largest paint can. 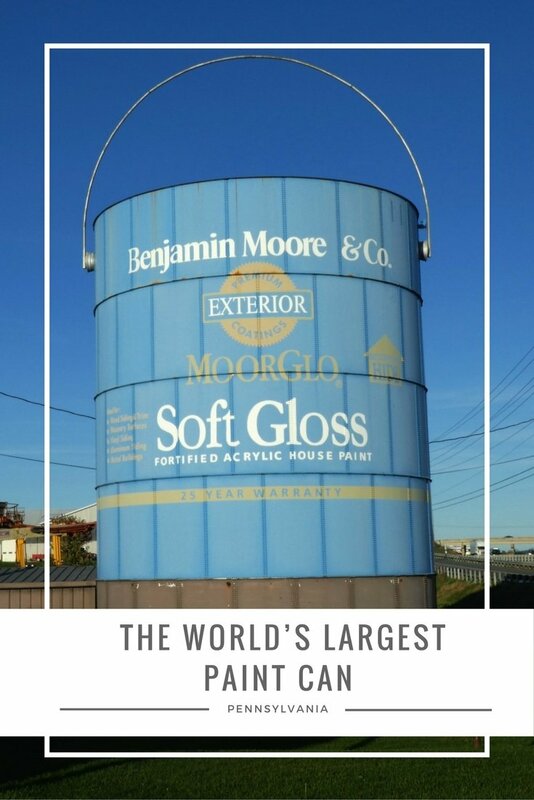 This 1000-gallon can of Benjamin Moore paint stands about 35 feet tall. You can catch a glimpse of it as you drive past or pull off the highway onto Exit 24 for a closer look. This attraction is located at 1000 Mt. Rock Road, which parallels the interstate making it an easy on/off and easy addition to your road trip. The paint can is located at A & A Decorative Design & Supply Inc., an independent Benjamin Moor paint retailer. The paint can has been a water storage tank for years but wasn’t transformed into a paint can until the location was purchased by the current owners. I stopped for a closer look on my recent road trip through parts of Pennsylvania. 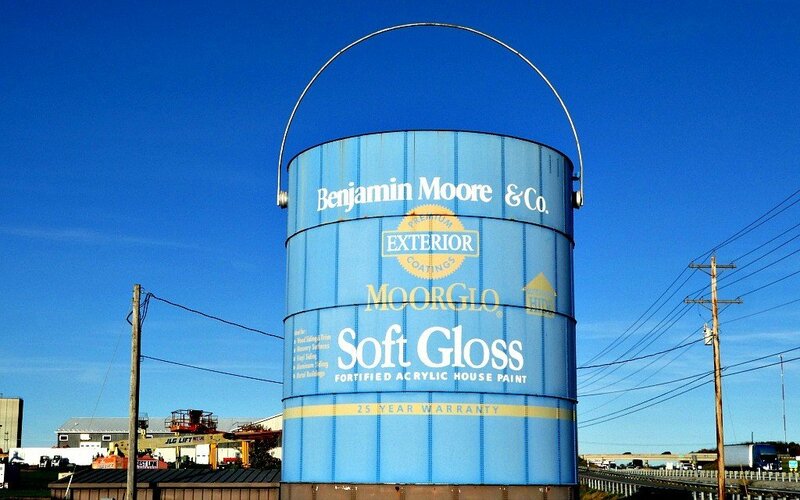 The giant paint can looks just like a Benjamin Moore can of paint and even includes a handle. This is a great spot for a selfie, though the occupants in my van felt that a quick stop in the parking lot was sufficient and didn’t require closer inspection. Have you seen the world’s largest paint can roadside attraction? Is this an attraction you’d stop to see? Oh my goodness! I had no idea this existed in PA! I might need to see if it is close enough to any of my relatives for a visit when I go there in the Summers! wow, such a large Paint Can. Thank you for sharing such an amazing pics.